Zarda Rice: Zarda Rice is a traditional South Asian sweet dish, made by boiling rice with (yellow) food coloring, milk and sugar and flavored with cardamoms, raisins, saffron, pistachios or almonds. 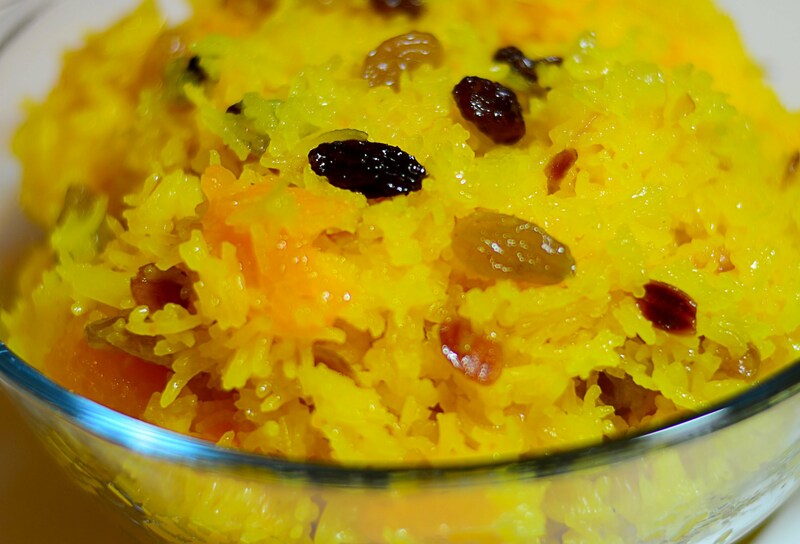 The name Zarda comes from Persian and Urdu ‘zard’ meaning ‘yellow’, hence named since the food coloring added to the rice gives it a yellow color. Zarda rice is typically served after a meal. In Pakistan and India, zarda rice remains a popular dessert on weddings. Soak rice in four cups of water for one hour. Heat two and a half cups of water in a deep pan. Add in the saffron strands, cloves and cinnamon stick. Add in the drained rice. Let the rice-water mixture come to a boil again. Reduce heat and let the rice cook till it is three fourths done. Divide the par-cooked rice into three portions. Melt 2 tablespoons ghee in a pan, on medium heat. Sauté the cashew nuts and raisins till golden. Spread a portion of rice, in a glass bowl. Sprinkle one-third of the sugar, one tablespoon ghee, one-third the grated mawa, one-third the fried nuts and a few drops of rose water on the rice. Repeat the layering of the rice and ingredients, twice. Mix a few drops of rose water and green cardamom powder in milk. Sprinkle the milk-rose water mixture on the top of the layered rice. Cover the bowl with double layers of aluminium foil. Place the bowl in the preheated oven. Cook for 15-20 minutes in the oven. Let the zarda rice stand for some time, about 10 minutes. Remove the aluminium foil from the bowl. Serve the zarda rice, hot. If you have any queries regarding the Zarda Rice recipe, please leave a comment.